A coyote wandering around Airdrie, Alberta, ended up on his way to Calgary after getting hit by a southbound vehicle on Highway 2. The owner of the vehicle, Georgie Knox, wrote in a Facebook post on Saturday about the wild hitchhiker, and how she thought the coyote had been killed when she hit him on her way to work. 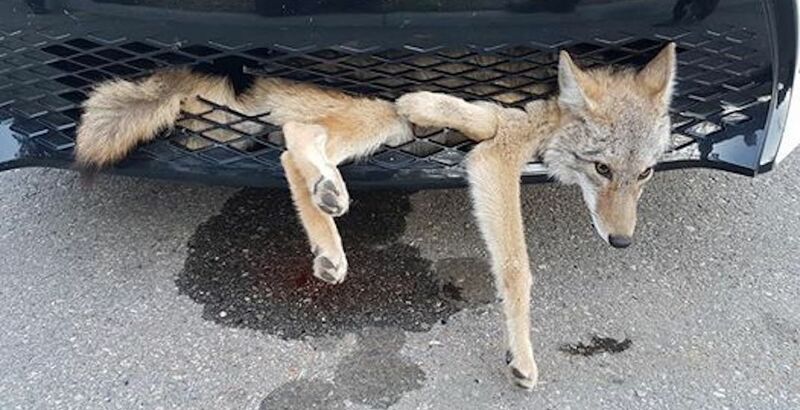 Little did Knox know that the furry traveller was along on the commute, and made it all the way to Calgary where a construction worker alerted Knox of the coyote in her vehicle. 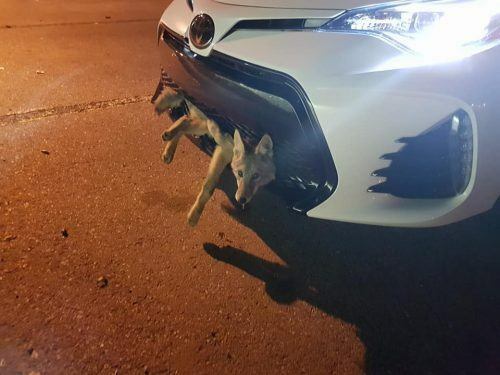 “Upon stopping at a traffic light by my work, a construction woman notified me that there was in fact a coyote still embedded in my car. When I got out to look, this poor little guy was looking up and blinking at me,” Knox wrote in the post. Airdrie to Calgary is roughly 30 kilometres, meaning that the coyote must have had quite the ride along the highway before being spotted. A biologist checked over the animal and declared him healthy enough to release back into the wild, and they set him free in Kananaskis, according to Knox’s post. “Clearly mother nature has other plans for this special guy!” she wrote.